I’m still here! I didn’t get around to posting anything about Saturday yet because, well, I didn’t do a whole lot. 🙂 That’s not to say I didn’t have a nice day though! As keen readers will have read in my last post, I started with another satisfying breakfast and writing up a post about Friday and no sooner had I finished that then my friend Matt arrived from Brighton (well, technically Hove, but close enough). When Scott and I were here in August, we went to visit him in Brighton, but this time, he came to London and booked a room in my hotel to spend (most of) the weekend here. 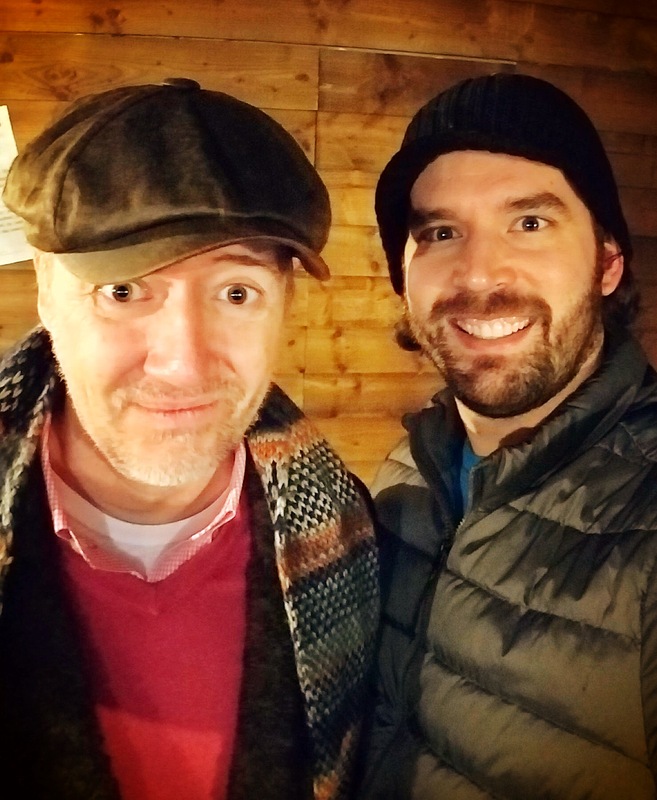 He’s been a great friend of mine for the past decade or so and I always look forward to seeing him, so we spent awhile catching up at the hotel after he arrived. The weather was pretty crap all of Saturday (ditto for today – more on that shortly), but we eventually decided we should go out for some food. 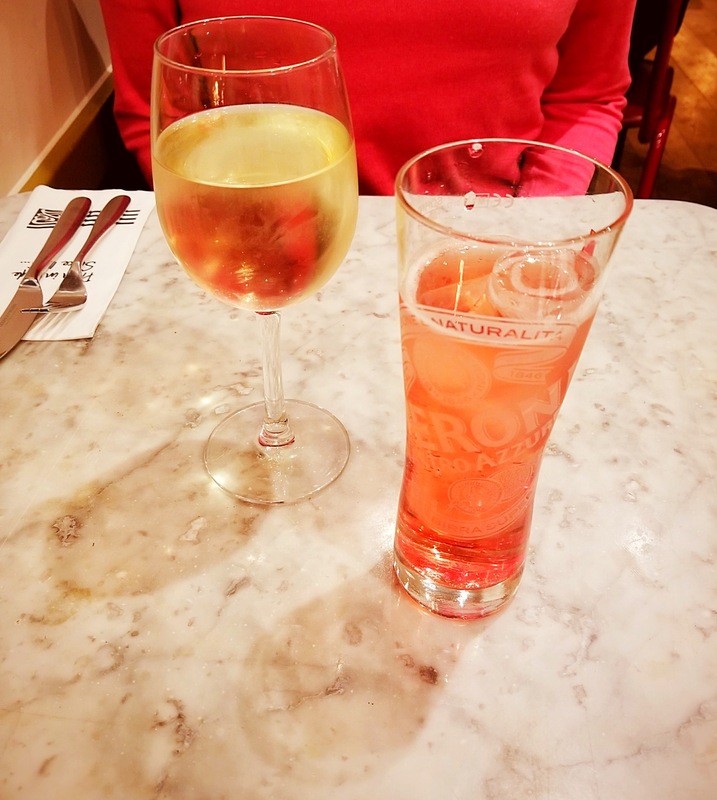 After a bit of walking around, we landed at one of my London standards – Pizza Express. As always, nothing fancy, but good food (and beverages), so we had fun! We had already planned to go to Retro Bar for drinks in the evening and, the day before, Matt made a quick Facebook event for it and invited any of our friends who were in the area that could possibly have made it on short notice. By the time we finished dinner though, we still had some time to kill before we planned to meet at Retro Bar, so we decided to walk towards South Bank to see the sights and grab at drink at the BFI bar. I’d never been to the BFI before, but I’ve been wanting to see something there! Side note – I find it really difficult to navigate their website to find a clear schedule of what’s playing on a particular day. So frustrating! I do still want to see a movie there sometime, but it probably won’t happen on this trip. ANYWAY! We didn’t even stay for a drink because the bar was really busy, so we walked next door to the National Theatre instead. Their bar was much less crowded, so we had a nice drink there. Sensing a theme here? Beverages. 🙂 We finally made it to Retro Bar at the appointed time and the two of us plus three other friends made it – thanks David, Darren, and Tony for coming! We spent the better part of 2-3 hours there and it was quite busy by the time we left (it was Saturday night, after all, so expect that if you go there on a weekend), but a good time was had by all. I did a crap job of taking ANY pictures on Saturday, so I just have a couple of gems to share. Beverages at Pizza Express. The cider I had was really nice! Matt looking pensive with his white wine. Aaaaaand, Sunday! Anyone want to guess how I started my day? Breakfast in the hotel! This time with added Matt. Somewhat determined to do more than we did on Saturday, we talked about a few different options, but landed on the Jack the Ripper Museum as Matt’s sister recently went there and had good things to say about it (well, as good as things related to a museum about a 19th-century serial killer can be). 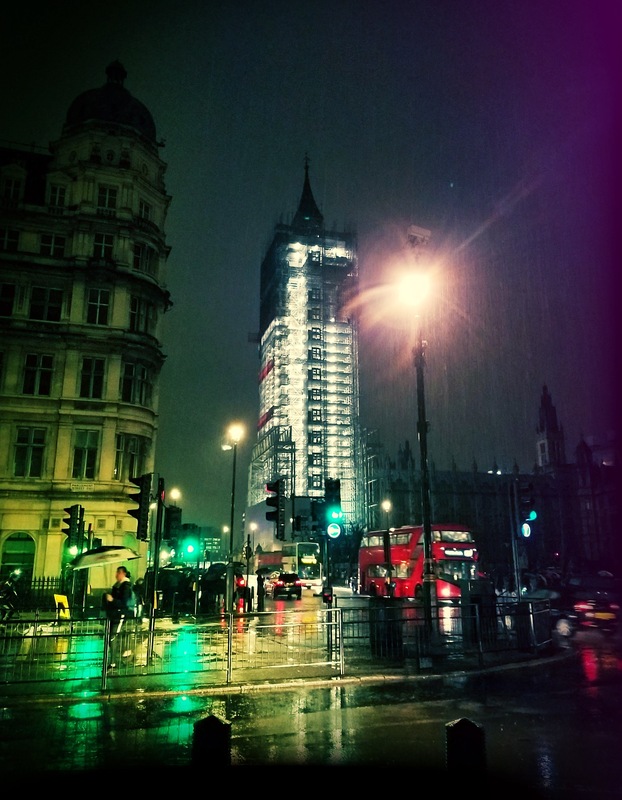 My central hotel location paid off again as we only had to go a few stops from St. James’s Park to Tower Hill and then walk a few minutes to reach the museum. It’s not a big building, though it does house more stuff than I would have expected based on the outside. 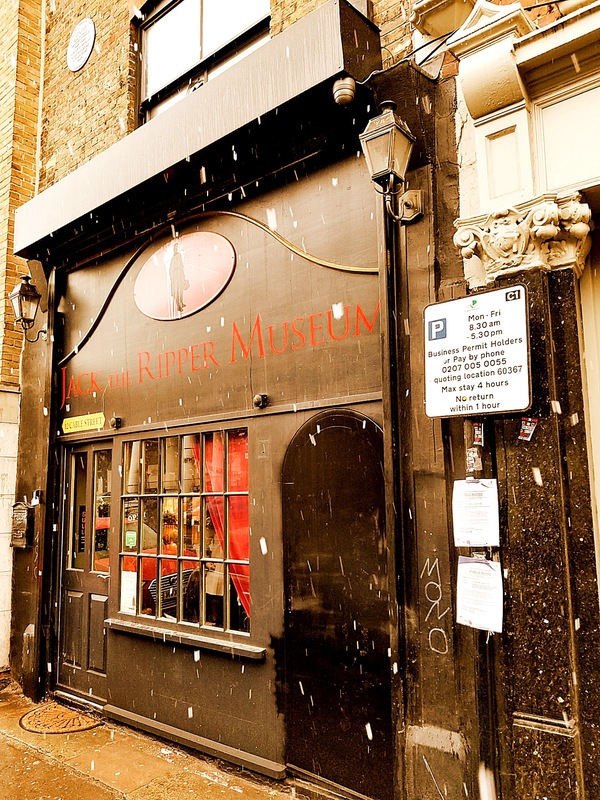 It holds four floors, plus a basement, all built around the case of Jack the Ripper. None of the floors are that big and they all center around the details of the cases, the victims, and the police who investigated the murders. 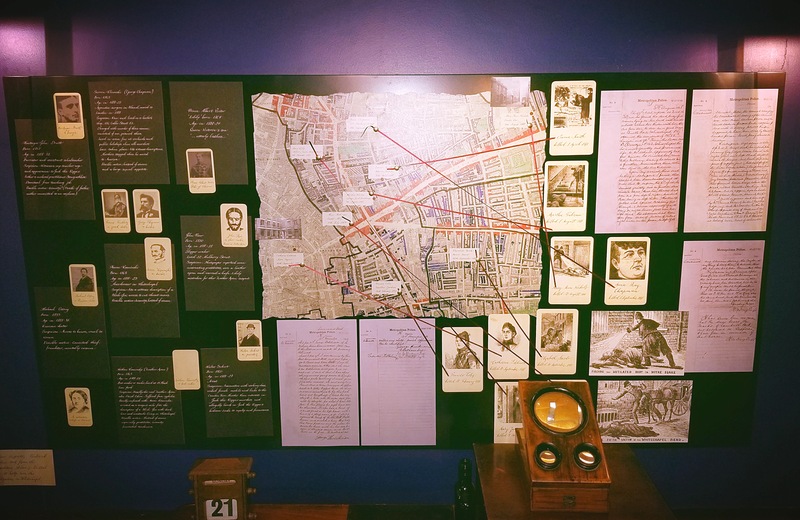 Since Jack the Ripper himself was never identified or caught (though there are LOTS of theories), there’s nothing much to say about the actual killer, though there is a bit of information about some of the suspects. 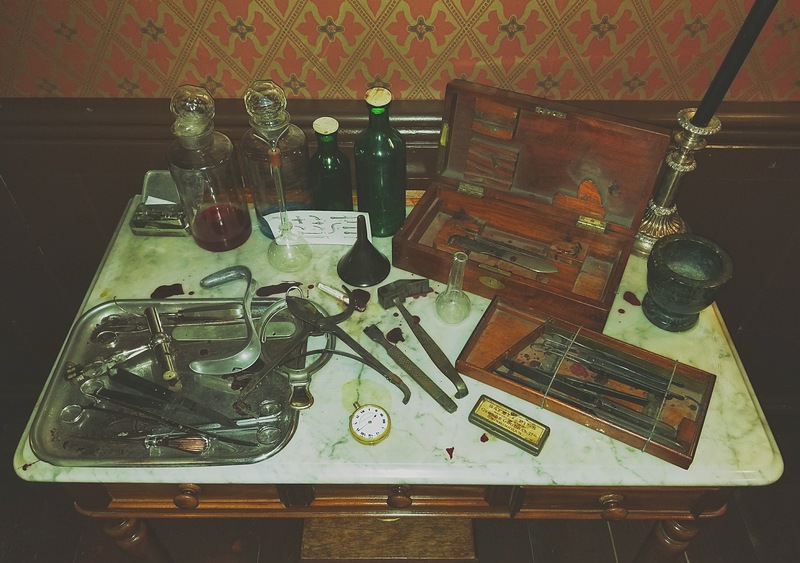 Obviously the subject matter of this museum is a bit macabre, so keep that in mind if you decide to visit. 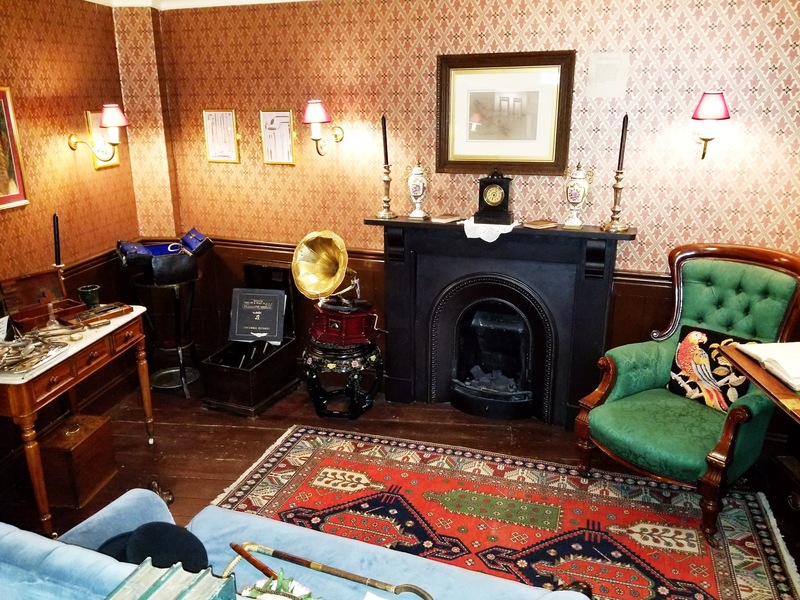 The contents of the top four floors contain mostly recreations of various aspects of the case (Mitre Square, the police station, etc. 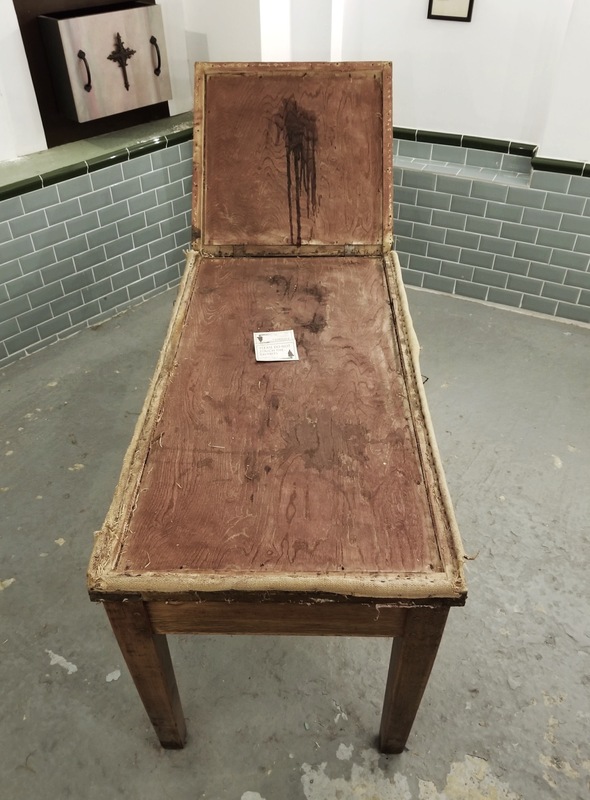 ), but the basement (just one room) is set up as a mortuary and does contain some very small photos of several of the victims from their autopsies. As the sign says when you enter the room, be aware that the images may be disturbing and be respectful of the fact that they are actual photos of the victims. Despite the subject matter, I did find the museum interesting and worth a visit. It costs £12/$17 USD, so not a big investment. 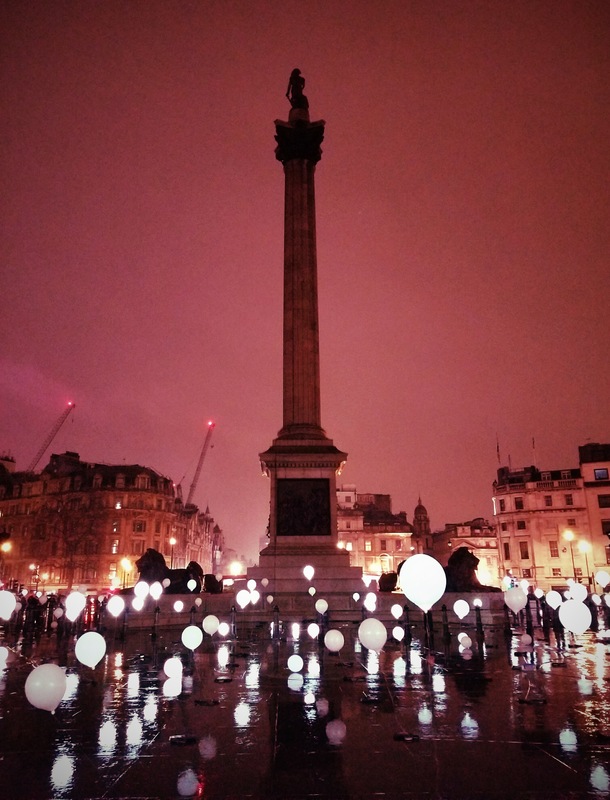 Check out the pictures below and think about visiting the next time you’re in London. Matt and I getting ready to tour the museum. 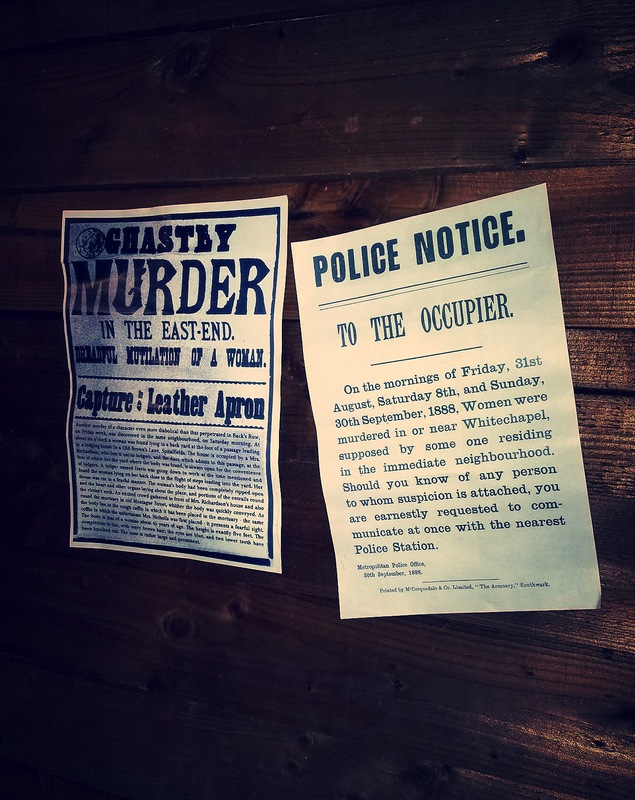 The walls are covered with reproductions of fliers and newspaper headlines/articles. 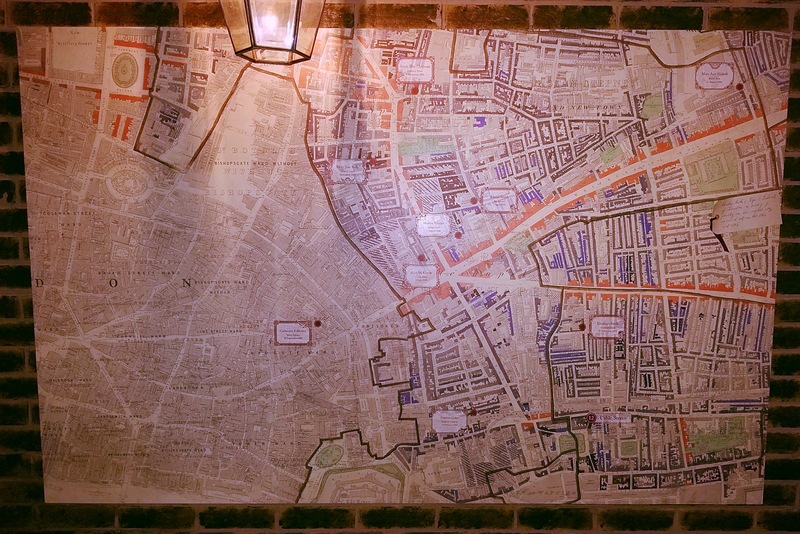 A map of Whitechapel, where the murders took place. 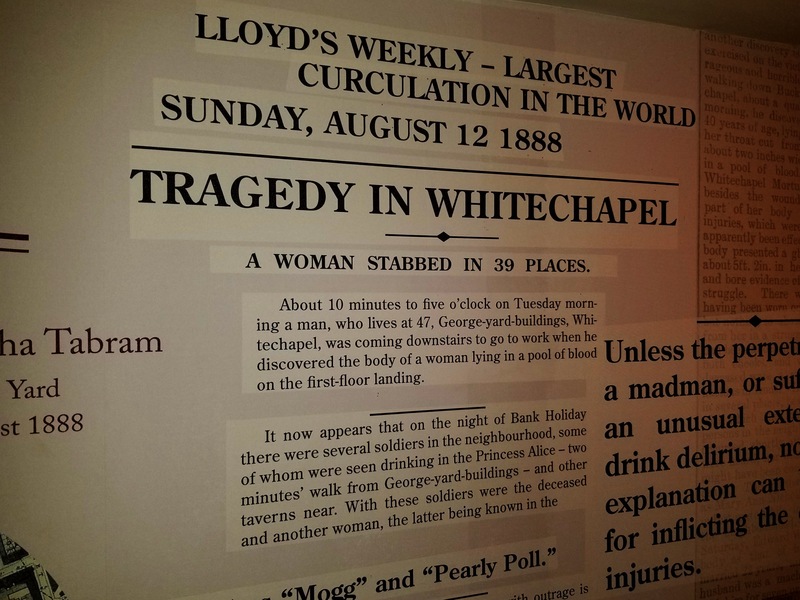 Newspaper reproductions on the walls. 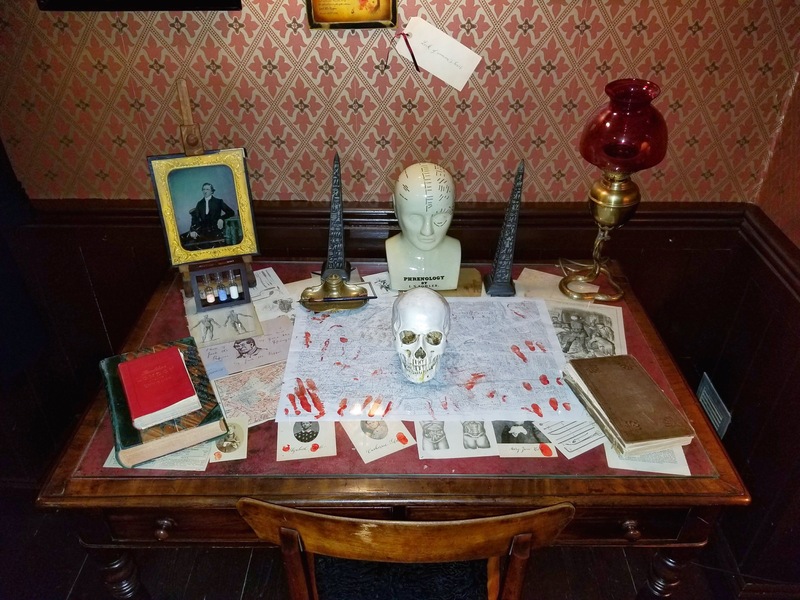 Reproduction of what Jack the Ripper’s study may have looked like (as depicted by someone who claimed to know who Jack the Ripper was and was accused by others of being either Jack the Ripper himself or an accomplice of his). More of the alleged study. 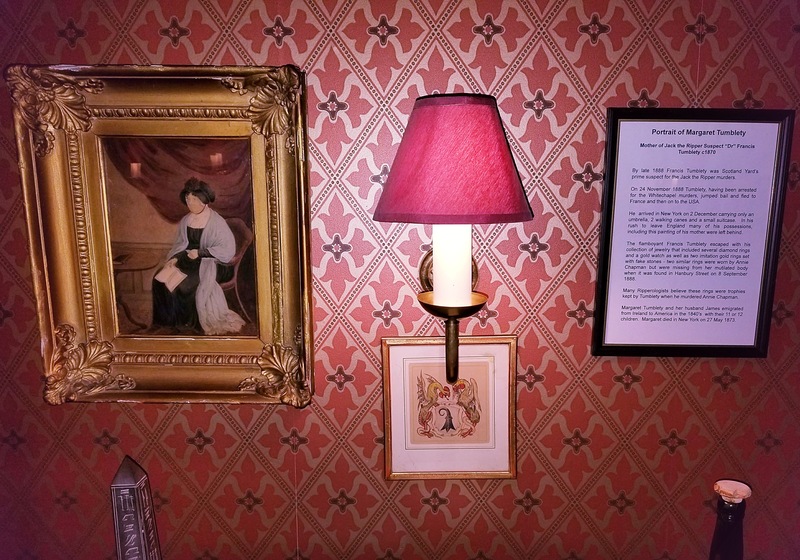 This is a portrait of the mother of a prime suspect in the Jack the Ripper case (click the picture to see the large version and read the details to the right of the portrait). 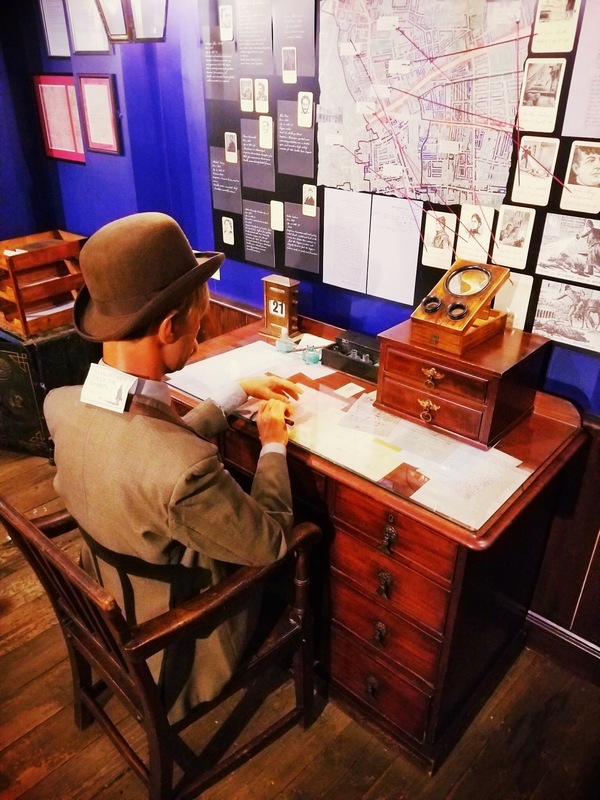 Reproduction of the police station where the case was being worked on. Board from the police station that tracks the suspects in the case. 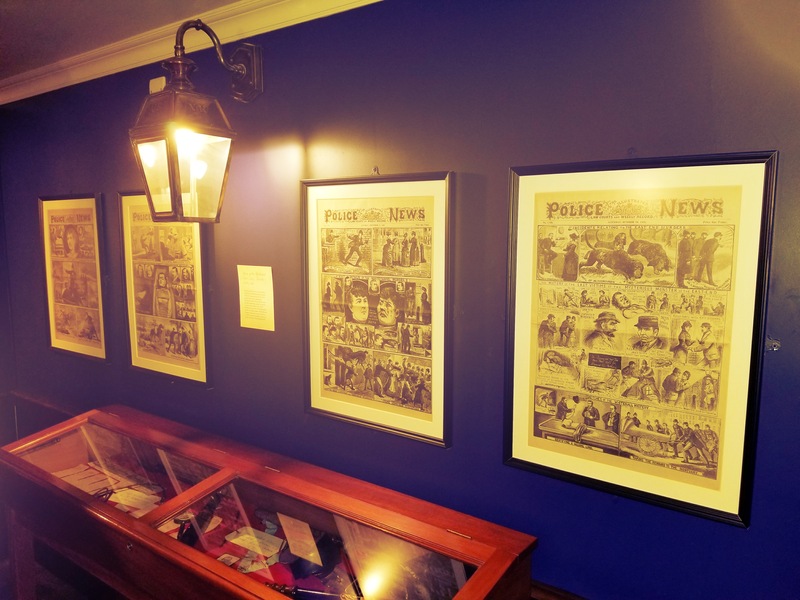 Framed issues of The Illustrated Police News, a weekly newspaper (tabloid, actually) covering Jack the Ripper. 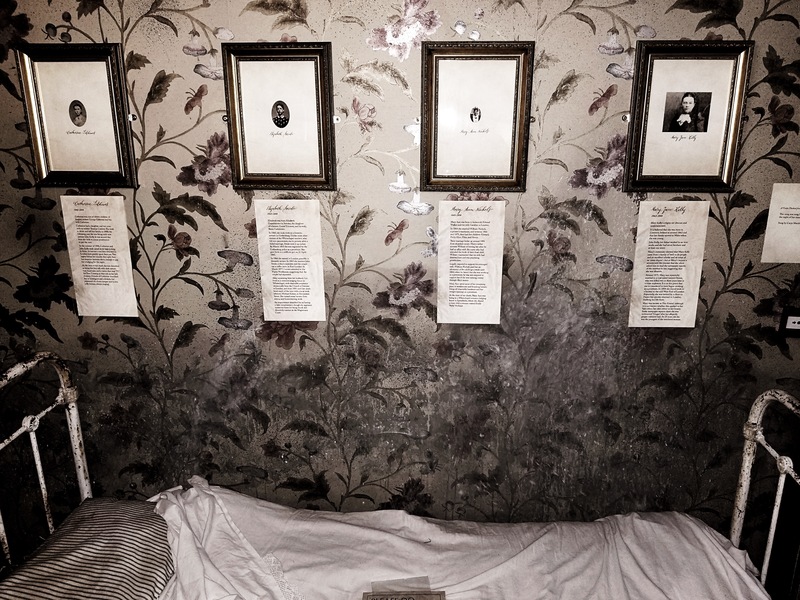 The top floor is a reproduction of what a victim’s bedroom may have looked like (hanging on the walls is information about the victims). This is the only picture I took of the mortuary space. The pictures I referenced earlier are on the walls (they’re very small), so be aware of that if you visit. 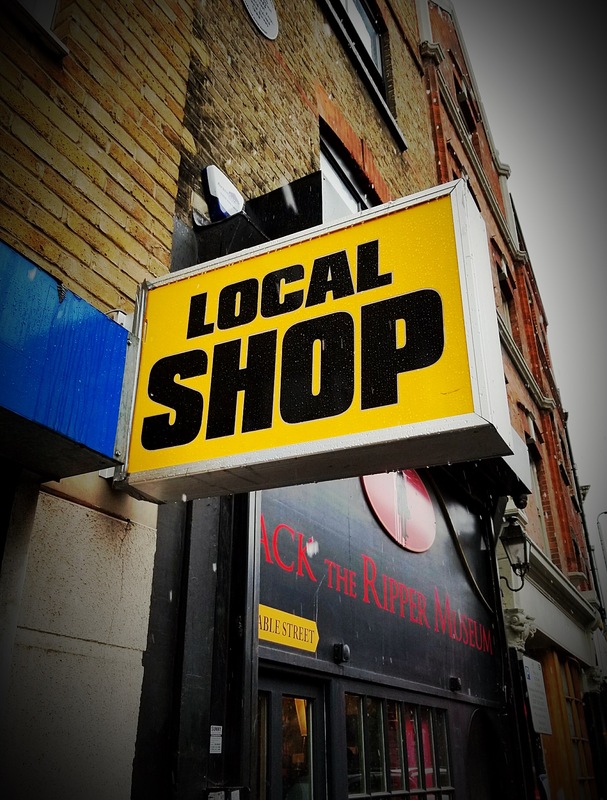 Fans of The League of Gentlemen will appreciate this sign. Trying to get a picture of the snow that was falling when we left the museum. 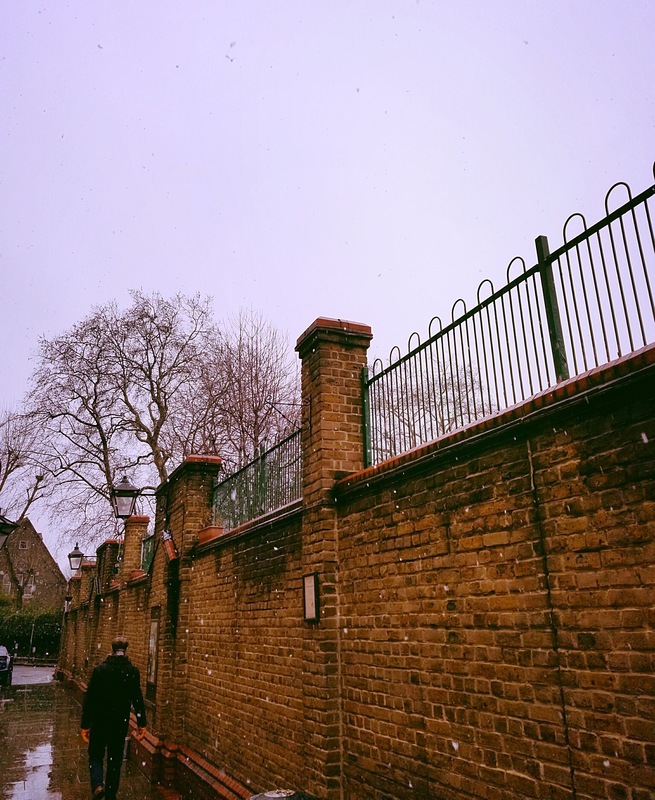 I’ve never been in London when it snowed before! 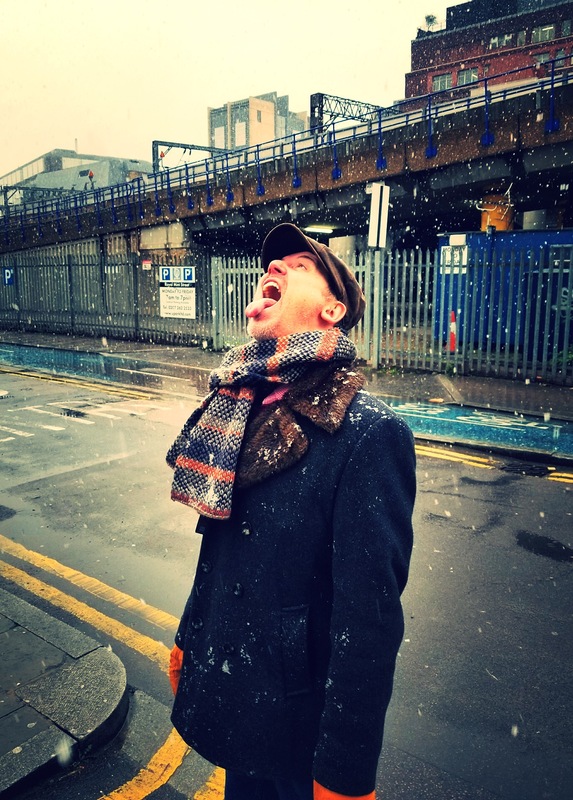 Matt doesn’t see snow often, so he decided to catch some on his tongue. That feels a little more magical than opening your mouth when it’s raining. 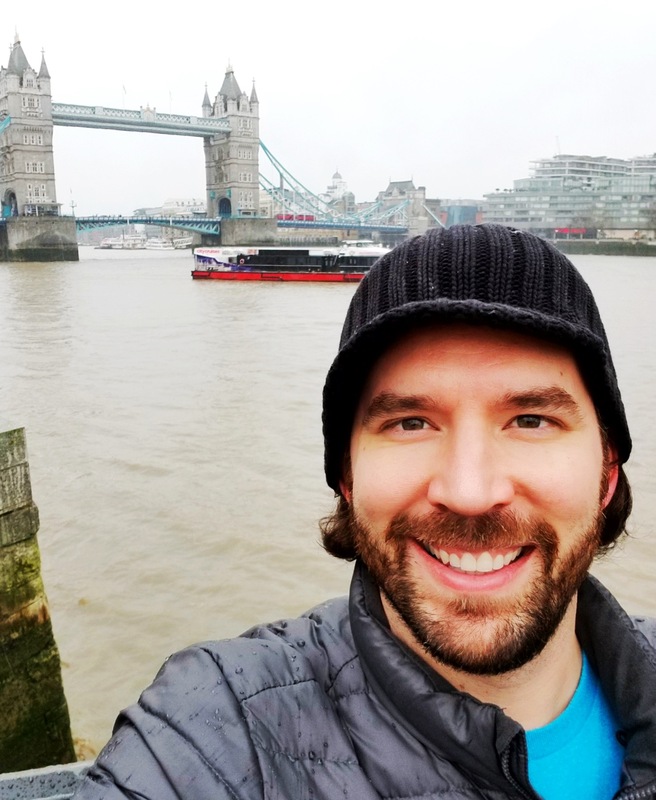 Because we were near my favorite London view, Tower Bridge, we decided (well, more like I decided, but Matt went along with it) to walk over there so I could get my required photos of it. 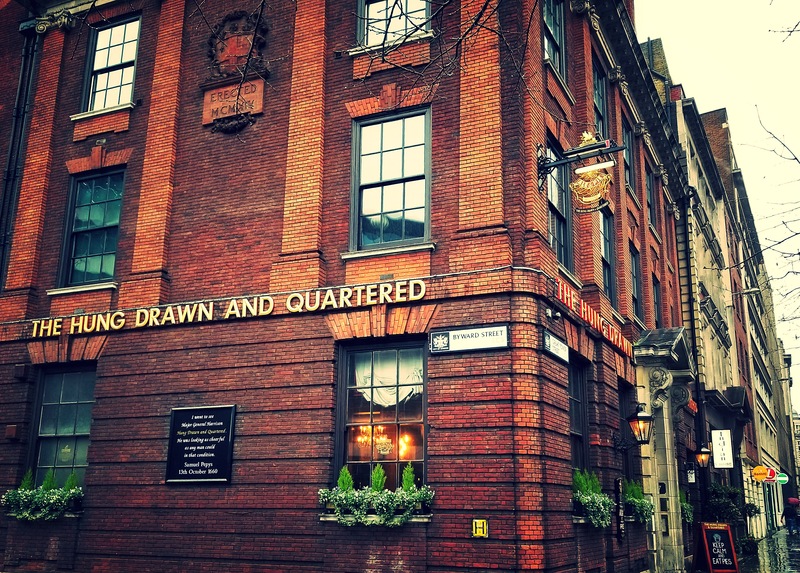 The snow was becoming mostly rain by this point, so we did it as quickly as possible and then made our way to a pub with a very interesting name – The Hung, Drawn, & Quartered. Although it’s part of a chain of pubs (Fuller), the atmosphere was nice and the food was tasty (Matt had a chicken/chorizo pie and I just had a side of chips as I wasn’t hugely hungry). 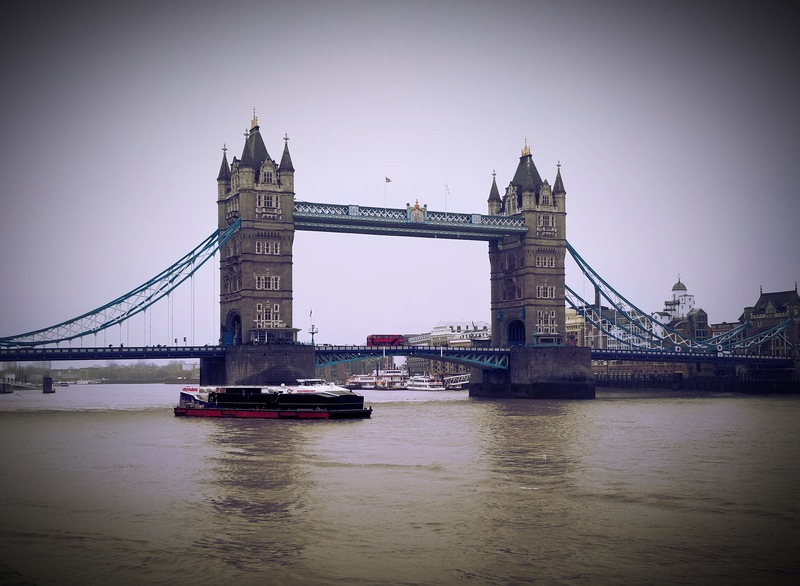 Check it out when you’re near Tower Bridge! Even on a grey day, I love this view! 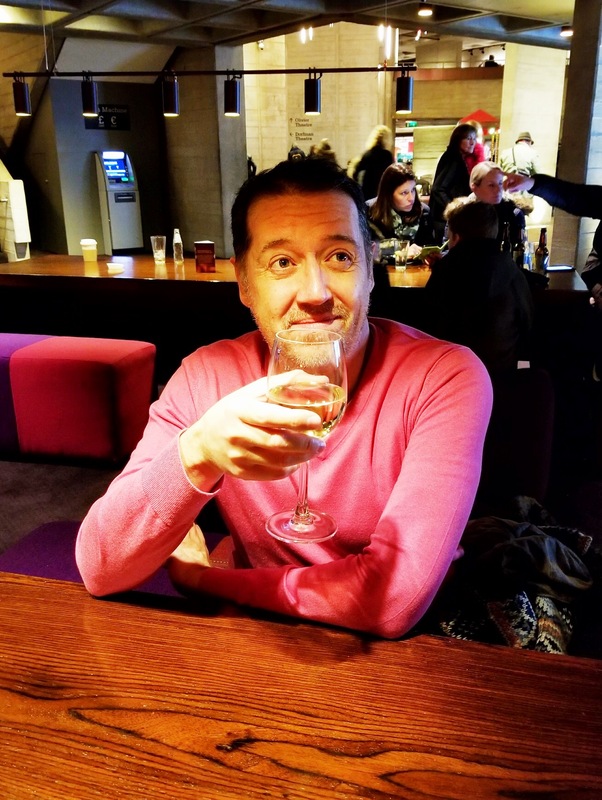 Never fear – I’m not done yet! We had been texting with another friend, Lisa, about potentially meeting up, so she came to meet us for a drink in the hotel bar. I hadn’t seen her for awhile, so it was great to catch up! I’ll actually be seeing her again during my annual trip to LA in a few weeks as well, but I’m always happy to get bonus catch-up time with friends. It was over far too quickly though as Matt had to catch a train and Lisa had to get back home, so Lisa headed for home and Matt grabbed his stuff from my room (since he’d already checked out) and made his way to the train station. I was right behind him though as I was going to stop by the store to get a few snacks to have around the hotel. 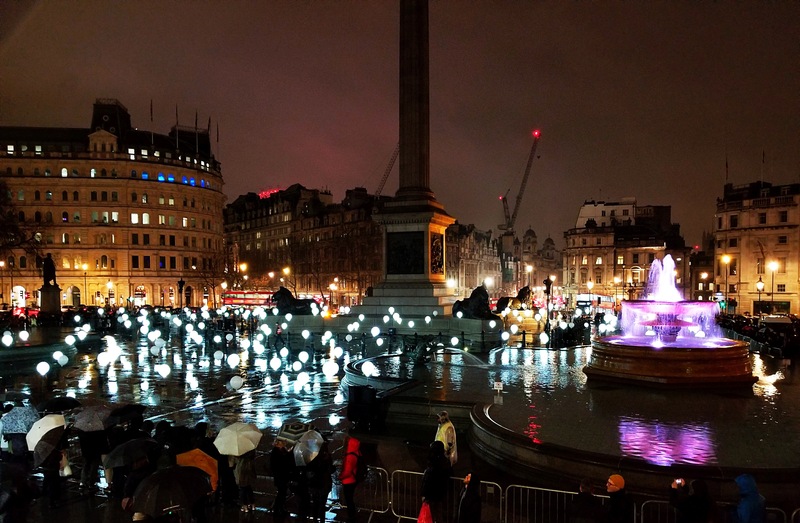 As I was walking though, I decided I would walk a bit further, back to Trafalgar Square, to see if I could catch any of the London Lumiere lights. 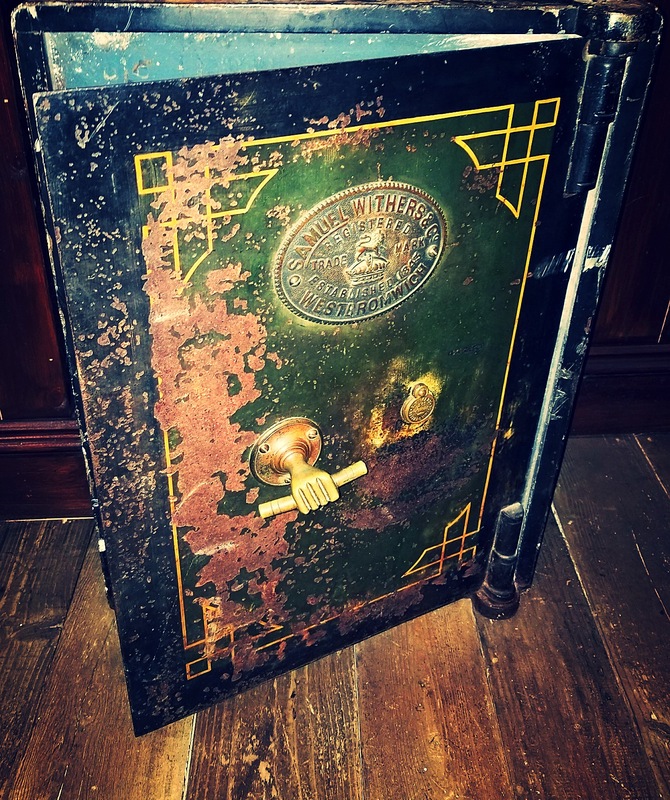 Check out the bonus photos below! Not part of the Lumiere (as far as I know), but I was curious what all the scaffolding looked like lit up. 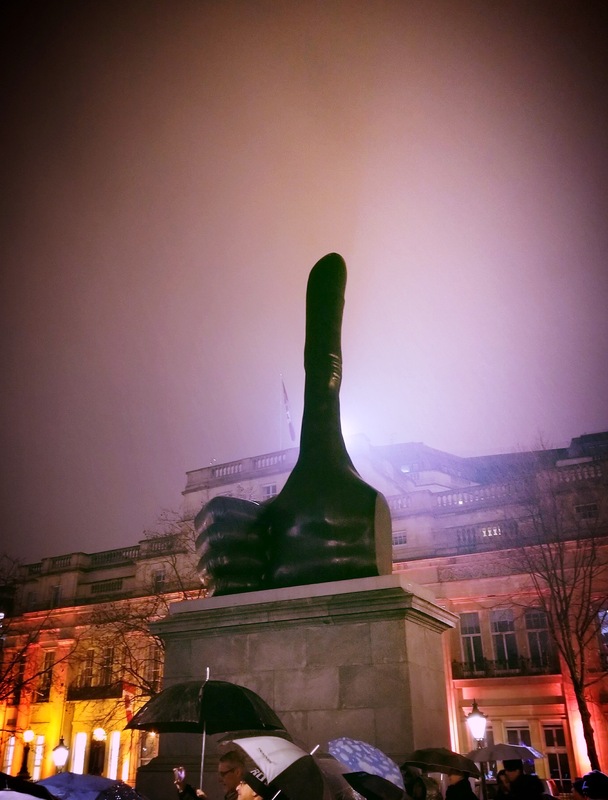 Really Good is still sitting on the Fourth Plinth. Anyone know when it will change again? 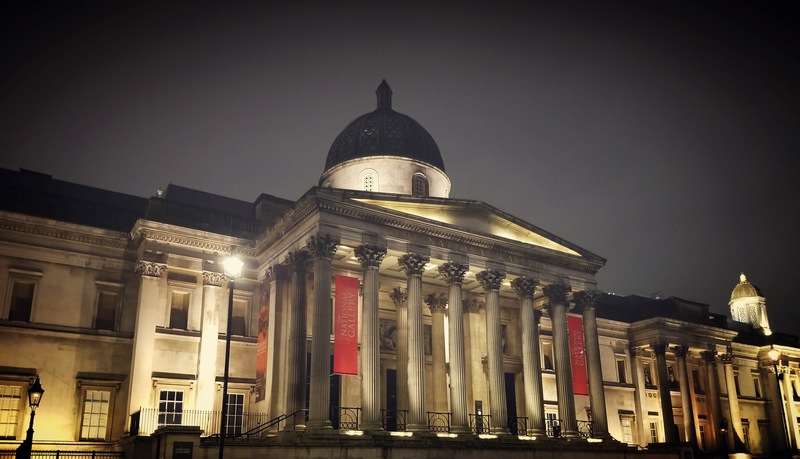 Nothing special about the National Gallery for the Lumiere – I just like the way it looks at night! 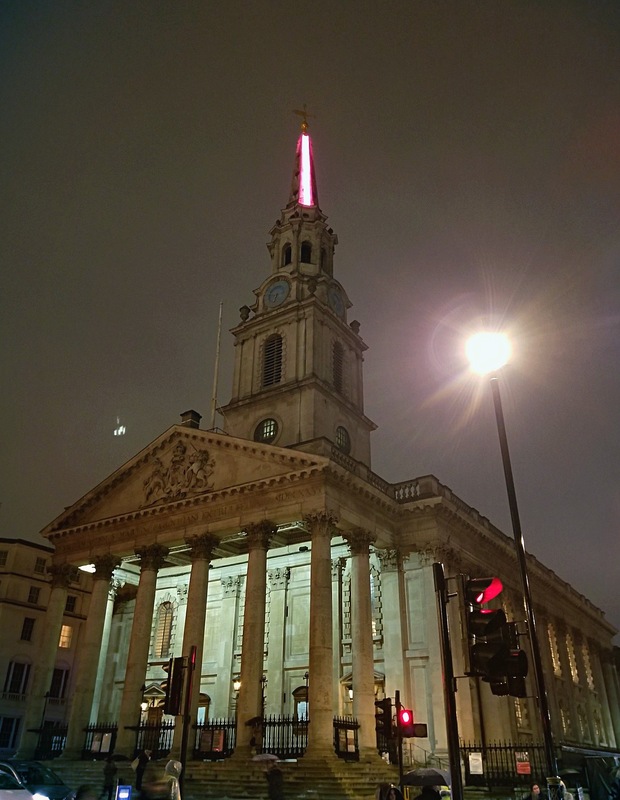 St. Martin-in-the-Fields had a pink ladder allll the way at the top for the Lumiere. 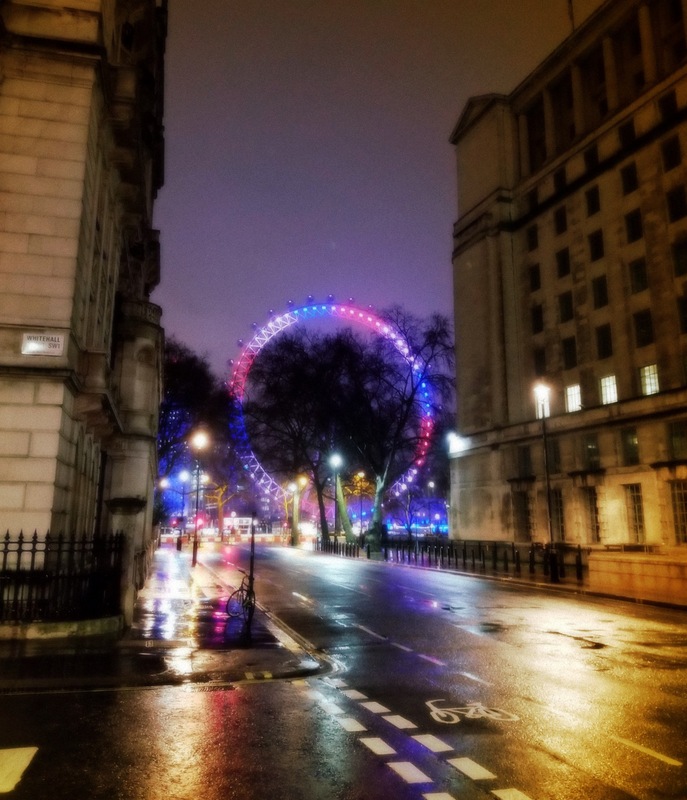 I grabbed a picture of the Eye lit up on the way home!